Senior Fellow at VIF (2010 -2017). Sushant Sareen did his masters in economics from the Delhi School of Economics and later qualified for the Indian Civil Service and joined the Indian Railway Traffic Service in 1993. A year later he resigned from Government and joined Public Opinion Trends, a news agency that monitors news and developments in South Asia. Since then he has been a close observer of the political situation in South Asia, specialising on Pakistan and by extension, India-Pakistan relations. He was the Executive Editor, Public Opinion Trends. He has also been Associate Editor, southasianmedia.net, a South Asian news portal being run by the South Asian Free Media Association (SAFMA). Sushant Sareen is also a founder member of SAFMA. For a short while he was General Secretary, SAFMA India and is currently a member of the SAFMA India Executive. Between 2002 and 2004, he was the Honorary Director, Pakistan Centre at the Observer Research Foundation. 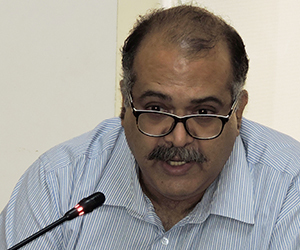 He has also been associated as a Consultant on the Pakistan Project of the IDSA. He is currently Senior Fellow, Vivekananda International Foundation. He is the author of the book: "The Jihad Factory - Pakistan's Islamic Revolution in the Making". In addition he has contributed chapters in books published by the Jamia Milia Islamia University, New Delhi and Jammu University. He has also contributed papers on the situation in Pakistan and on India-Pakistan peace process for journals like World Focus, AGNI and Dialogue. He has written columns for a number of Indian newspapers including The Pioneer, Tehelka, Sakaal Times, rediff.com, India Abroad, Ajit, The Tribune, Deccan Herald, New Indian Express etc. Sushant is also a regular feature on various TV and radio networks, including Times Now, CNN-IBN, NDTV India, Headlines Today, NewsX, Aaj Tak, ABP News, IBN7, ANI, Radio Pakistan, PTV, Lok Sabha TV, and DD News. Sushant Sareen did his masters in economics from the Delhi School of Economics and later qualified for the Indian Civil Service and joined the Indian Railway Traffic Service in 1993. A year later he resigned from Government and joined Public Opinion Trends, a news agency that monitors news and developments in South Asia. Since then he has been a close observer of the political situation in South Asia, specialising on Pakistan and by extension, India-Pakistan relations. He was the Executive Editor, Public Opinion Trends. He has also been Associate Editor, southasianmedia.net, a South Asian news portal being run by the South Asian Free Media Association (SAFMA). Sushant Sareen is also a founder member of SAFMA. For a short while he was General Secretary, SAFMA India and is currently a member of the SAFMA India Executive. Between 2002 and 2004, he was the Honorary Director, Pakistan Centre at the Observer Research Foundation. He has also been associated as a Consultant on the Pakistan Project of the IDSA. He is currently Senior Fellow, Vivekananda International Foundation. He is the author of the book: "The Jihad Factory - Pakistan's Islamic Revolution in the Making". In addition he has contributed chapters in books published by the Jamia Milia Islamia University, New Delhi and Jammu University. He has also contributed papers on the situation in Pakistan and on India-Pakistan peace process for journals like World Focus, AGNI and Dialogue. He has written columns for a number of Indian newspapers including The Pioneer, Tehelka, Sakaal Times, rediff.com, India Abroad, Ajit, The Tribune, Deccan Herald, New Indian Express etc. Sushant is also a regular feature on various TV and radio networks, including Times Now, CNN-IBN, NDTV India, Headlines Today, NewsX, Aaj Tak, ABP News, IBN7, ANI, Radio Pakistan, PTV, Lok Sabha TV, and DD News.